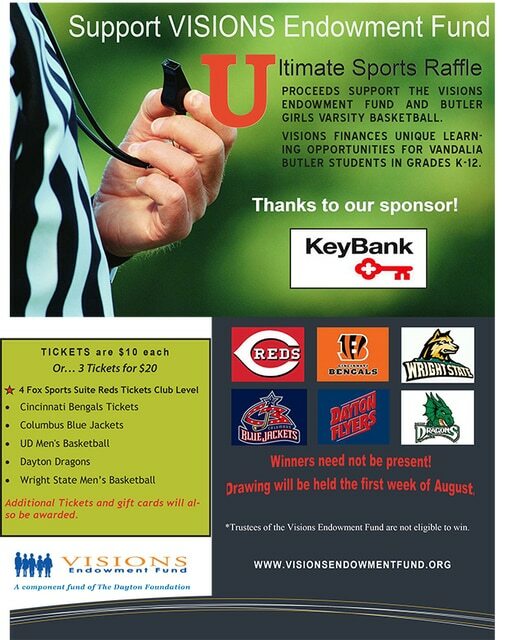 VANDALIA – The Visions Endowment Fund is holding an Ultimate Sports Raffle to benefit both the Visions Endowment Fund and the Butler varsity girls basketball team. The Visions Endowment Fund finances unique learning opportunities for Vandalia – Butler students in grades K-12. Tickets are $10 each or three for $20. The drawing will be held the first week of August, and winners need not be present to win. Please note that trustees of the Visions Endowment Fund are not eligible to win. Click here for a flyer. The sponsor of the Ultimate Sports Raffle is Key Bank.